In the past, I've mentioned Chris Baker's series Wheel Gun Wednesday as featured on Lucky Gunner. On his quest for the perfect revolver, I learned of the Smith & Wesson Model 66. About a year after Chris posted the entry The Best Revolver in the World, I stumbled across a 66-6 on Gun Broker and didn't hesitate to purchase it. I totally agree with Chris about this being the best revolver in the world, but the addition of a red dot sight makes it even better. The Smith & Wesson Model 66-6 was produced between 2002 and 2005. S&W discontinued the model for about a decade before demand revived to the point that an updated model was released in 2015. This 66-6 is relatively desirable due to the factory three inch barrel, but the internal lock kept the price reasonable by the time I located it. The three inch barreled version of the Model 66 weighs in about 32 ounces which helps to mitigate recoil. The barrel also allows for a full length ejector to ensure positive extraction of spent brass. Internet chatter reveals that people really like the three inch barrel and after shooting it myself, I understand. After adding a set of rubber Hogue fingerless grips, the revolver fits perfectly in my hands. I also changed the front and rear sight blade, but I'll discuss that in another post. Unloaded and pointed down range. Just wanted to show the hammer. In a previous post, I listed several parts for a proposed Carry Optics division. 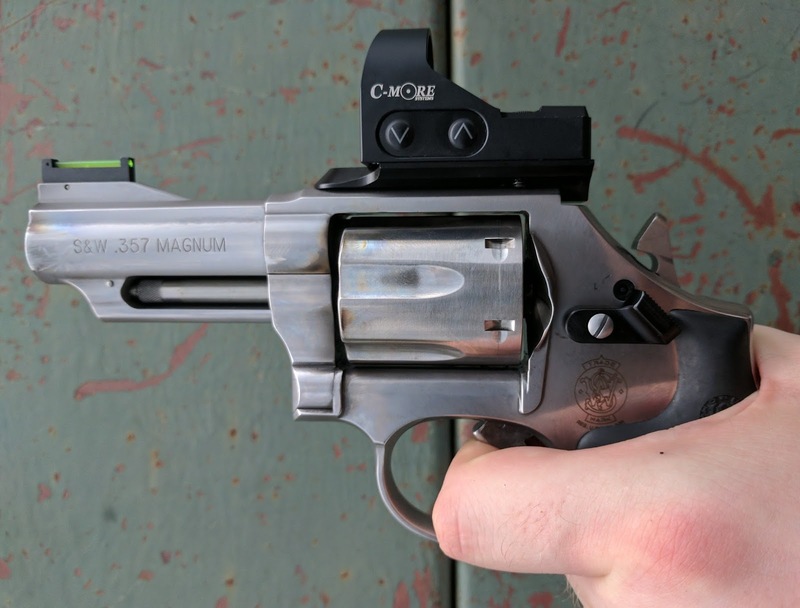 As this is a review of the Model 66 Carry Optics, I'd like to go into a bit more detail regarding these specific upgrades. This was the first handgun in my collection to host an electronic sight. I enjoyed shooting a Glock with a slide mounted optic but was hooked by an Open Division 2011. This was mostly because the frame mounted dot remained stationary while the slide reciprocated. As sights increase in reliability and decrease in size, they are more accessible even to the budget conscious shooter. I believe mini red dot sights will become standard options on pistols of all shapes and sizes within a few years. The optic I selected is a CMore RTS2 with a 6 Minute of Angle (MOA) dot. Rather than the battery mounted between the optic and the firearm, a small removable shelf holds the battery in place. This allows the battery to be changed without removal of the sight and should keep the optic zeroed. Battery life is not as long as some competitors, but is still quite respectable at medium brightness with a clearly defined dot. To top it all off, the adjustments and controls are easy to manipulate. After I selected an optic, I needed to locate a suitable mount. Not many companies manufacture optic mounts for Smith & Wesson revolvers, and I didn't really want use a giant picatinny rail. Although I located a couple different options, the best mount I found was made by Allchin. The Allchin is very low profile and places the dot much closer to the bore, especially when compared to a dot placed on a picatinny rail with a bulky mount. This allows for less height over bore issues and easier zeroing. A good compromise of size and function is the release made by California Competition Works. As a left handed shooter, a cylinder release with a flat and wide face opens the revolver faster. At this point in my testing, it has not resulted in any hang ups while using Safariland Comp III speed loaders or caused any extraction issues. I also picked up a similarly profiled Cylinder & Slide release that I may try down the road. The last part I installed was the APEX Tactical Evolution IV Hammer. Honestly, I needed to convert the revolver to double action only from the start. I have only fired in single action a handful of times, but my zero is based on my double action pull. I was aware of the the APEX part and a local gun shop actually stocked both the K/L and N Frame model hammers. I purchased them when the store placed them on clearance, so I basically got a 2 for 1 deal! Our local revolver guru, Steve, fit the hammer and did some great trigger work. He smoothed everything out and re-profiled the trigger face. After all that work, the pull weight is right under eight pounds with positive ignition on most primers. As soon as I found my Smith & Wesson 66, I ordered a Milt Sparks PMK holster. The wait time on custom leather holsters varies, but I ended up receiving that right at twelve weeks. An old open top Don Hume rig filled the holster role while I familiarized myself with the revolver. The opening was just long enough to permit a frame mounted red dot...so a revolver wearing a red dot soon rested in the holster. 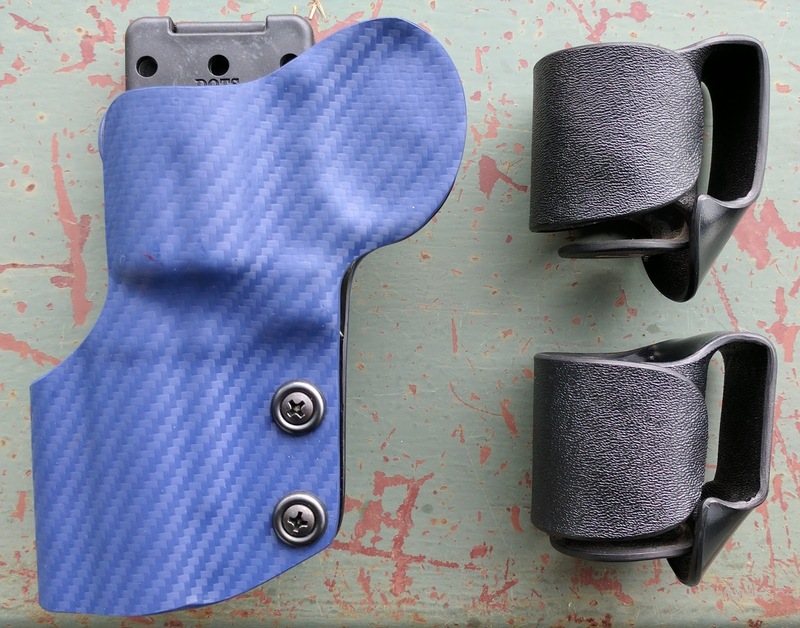 This set up functioned for a while, but I wanted a kydex holster with adjustable retention for competition. I contacted Bill at Master-Tac Holsters and a custom race ready piece of kit was at my door in less than a week. Bill makes the majority of my kydex equipment and always does great work. The double layer holster both fit and supported my optic equipped revolver perfectly. Please visit the Master-Tac Holsters Facebook page and check out some of Bill's work. Shooting the Model 66 Carry Optic is incredibly fun. Standard pressure .38 Special loads recoil very lightly and .38 Special +P loading are manageable. I've fired a handful of .357 Magnum rounds, but the recoil is stout. I'm happy as can be shooting standard pressure .38 Specials all day at the range. The addition of a mini red dot sight further improves the overall shooting experience. 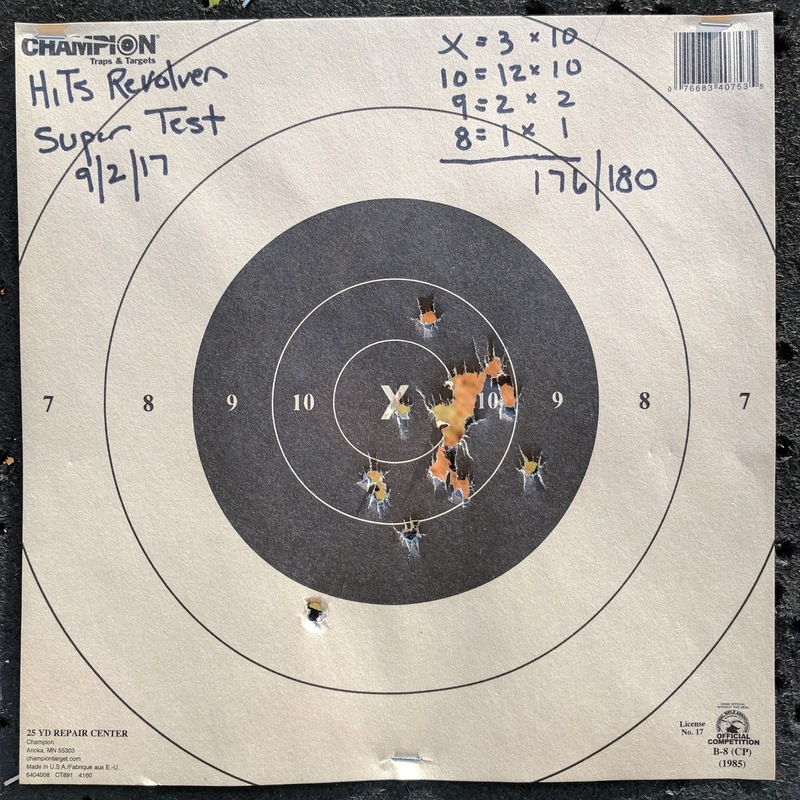 I can hit a plate at distance without too much effort, but I'll admit that I have definitely misaligned the sights and missed shots before. That is where an optic really shines: distance. The dot aids in making hits on targets beyond the 25 yard line. 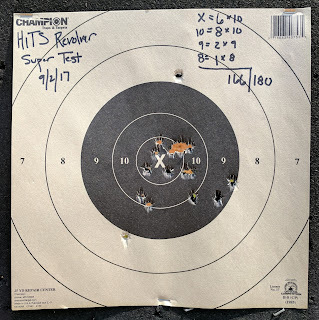 So far, the farthest distance I've attempted is 35 yards, and I reliably make hits with good trigger control. Keep in mind, the dot is not magic. You can't expect good results if you don't manipulate the trigger well. Nearly all in the black. Scoring the NRA B8 target is easy; total up your points excluding misses and shots after the timer. A passing score is a 162/180. This was the first run of the day. I focused on speed a bit too much. I only threw two shots, and the first one was the on slight low-left. I passed, if only barely, with 166/180 points. That little guy? Don't worry about that little guy. The second attempt at the drill showed much better results. 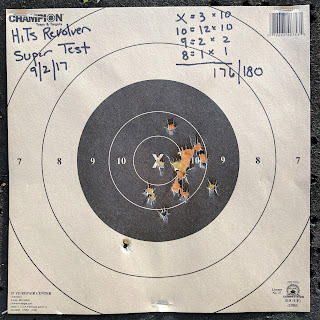 I slowed my pace and concentrated on a smoother trigger press. The results show improvement. 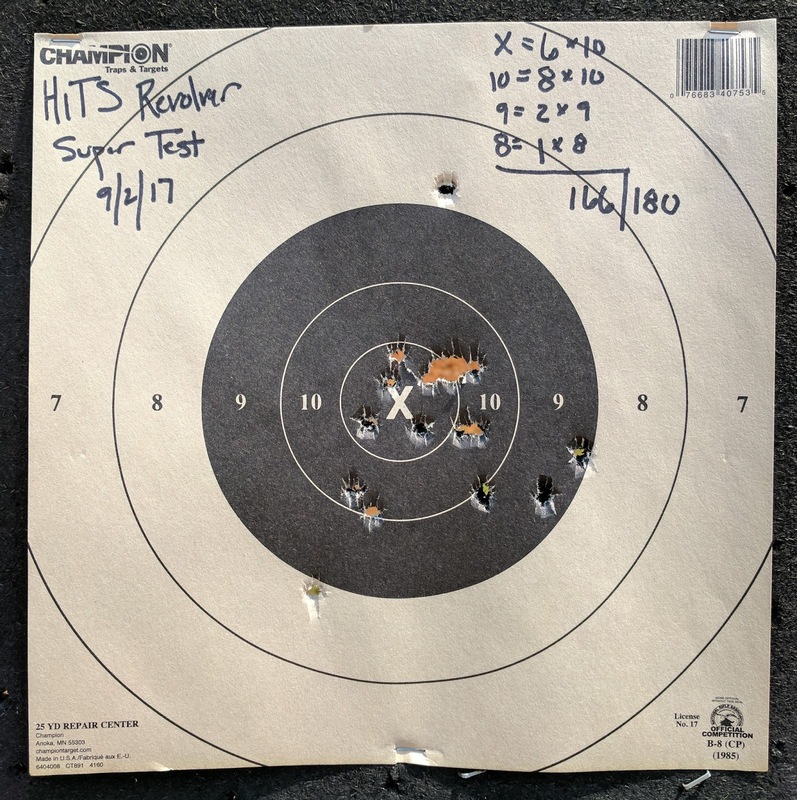 The first shot was low and left again, so I need to work on presentation. The red dot significantly improves shooting at the 15 yard mark when compared to iron sights. 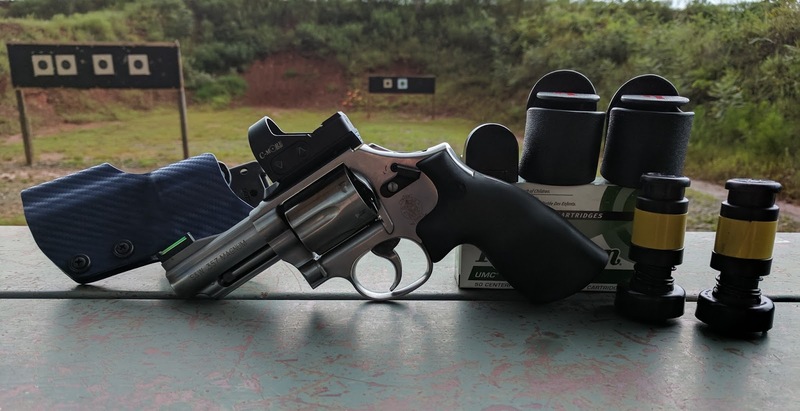 Despite the prevalence of plastic fantastics and steel framed auto-loaders, the demand for revolvers with barrel length of two and three inches has not subsided. In fact, another model featuring a 2.75 inch barrel is now available from Smith & Wesson. I might have to add one of those to the stable in the future, but we'll see. Overall, the Smith & Wesson Model 66 is about as good as a compact revolver can be. The shorter barrel length and relatively light weight results in great ergonomics and balance. Adding an optic further improves this wheel gun by improving a shooter's ability to successfully make hits both up close and at distance. If you happen across a three inch K frame like this you should absolutely pick it up. Thanks again for posting about this revolver Chris! 6 mil seems like a huge dot. I want to put a red dot on my model 48 for hunting, but a 6 mil dot would probably completely cover up a squirrel. I shoot bullseye with a 2 mil dot on my pardini.